After seven years of living with the grottiest bathroom on the planet, we’ve finally managed to update it – huzzah! ​Now I realise this blog isn’t really about interior design, but I was so excited I had to share it. A colourful and fun take on a steampunk bathroom. It’s amazing what you can live with (seven years!! ), but now we finally have a beautiful, fun, funky and actually rather peaceful bathroom of our very own. This is how our bathroom looked before and after… looks like two completely different rooms! So what did we do? Well, to start with, you may have noticed in the pictures above that the bath and sink have swapped places. We got that idea looking at pictures of a neighbouring property up for sale a few doors down from us. It’s amazing how much better the space feels with the area in front of the window opened up.We may never have thought of this on our own, so If you’re doing up your own place, I highly recommend checking out similar properties in the area for inspiration on layout, if nothing else. It was such a simple and easy (so the plumber told me) change, but makes a massive difference. 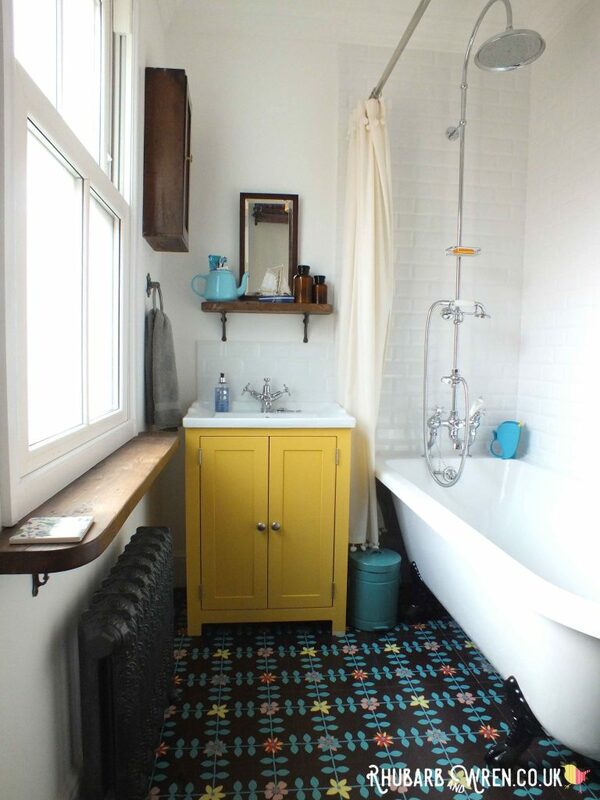 Yellow vanity, roll-top bath, cast iron radiator – all our bathroom dreams! I originally wanted decorative encaustic tiles, picturing them with a clean white suite, glossy white metro tiles and white walls. But not only do they cost more than gold, they’re also hard and unforgiving on young children and the things they throw. 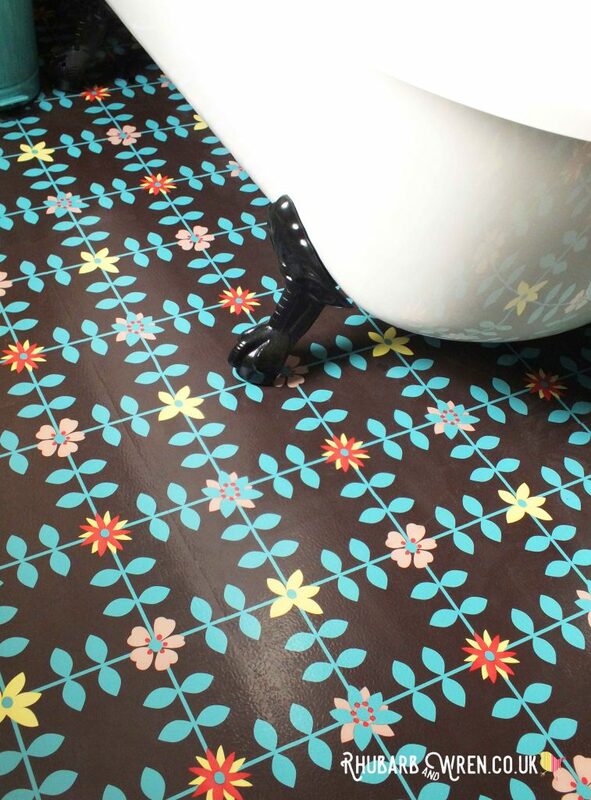 So we went instead for these pretty vinyl tiles from Zazous. They were majorly inexpensive, are softer and warmer underfoot than tiles, and are sooooo lovely! 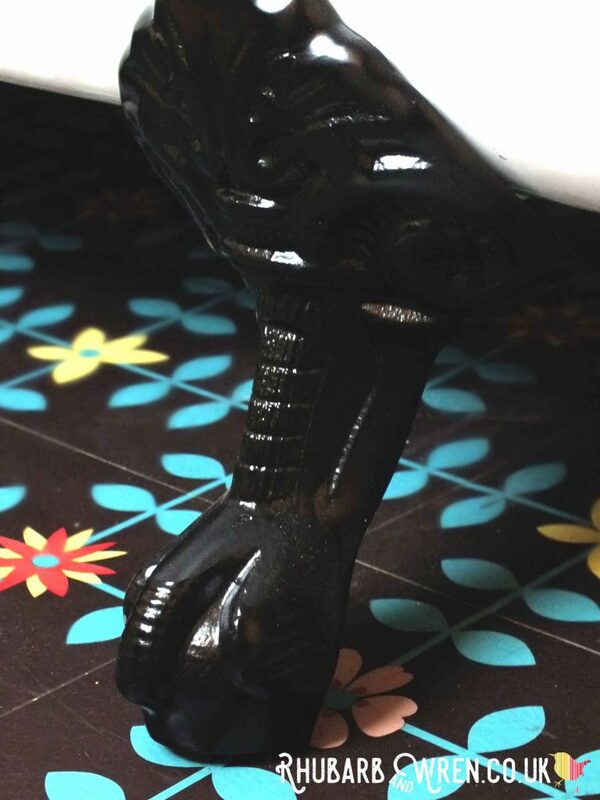 I’m rather glad we were too poor for the posh tiles now, as I wouldn’t change these for anything. The background of the floor tiles is a deep chocolate brown colour, and it inspired me to source vintage storage, shelves and mirror with rich, aged wood. I think it helps the room feel less clinically sterile (though no less clean!). ​The tiles also gave our bathroom the colour palette we’ve used to accent all that crisp white – bright turquoise and teal, sunny yellow, and the odd touch of red and lilac-pink. 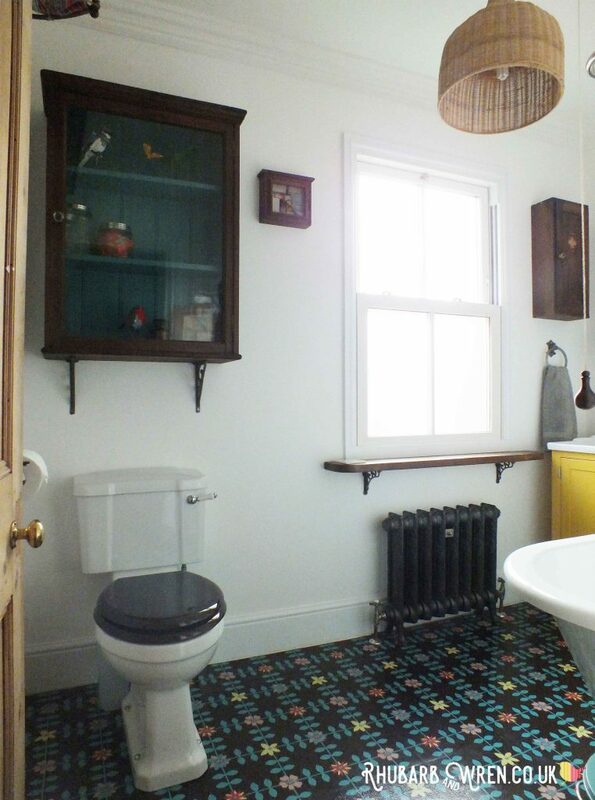 The colours are really vibrant but as they’re kept mostly to a couple of blocks of solid colour (the yellow vanity unit, and teal cupboard interior above the toilet – pretty much everything else is bright white), it feels charming and restful rather than overwhelming. 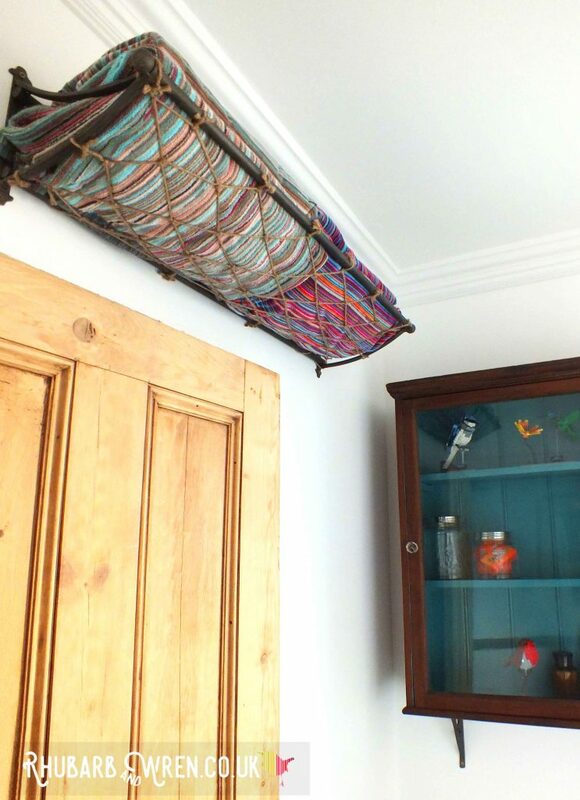 This vintage style luggage rack keeps towels close at hand. 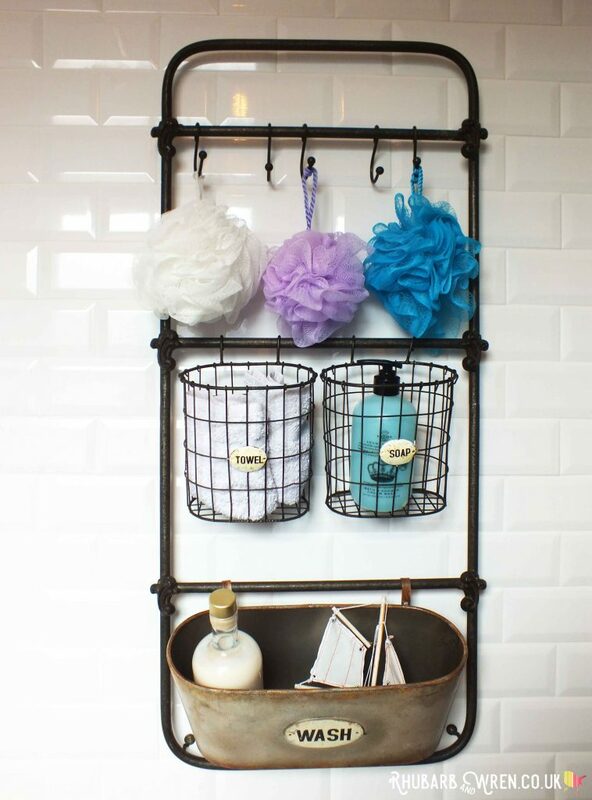 You can never have enough bathroom storage. When you have young kids, clutter seems to accumulate everywhere. I wanted to keep the bathroom relatively clear so that there was at least one room I could retreat to that had some grown-up serenity to go with my glass of wine. That was why we went for a vanity unit under the basin and lots of hanging cupboard space. It makes me very happy that the cupboard is big enough for a mop and bucket too, as I’ve learnt the hard way to keep our cleaning supplies close at hand if they are actually going to be used. We also appropriated one of the kids’ Ikea Knodd bins (used for toys in their rooms), to store bath toys instead. The colour is a great match, it was free and it’s small enough to tuck discretely under the curve at the foot of the bath. No more giant Bubble Bath Peppa Pig looming over me while I bathe. Not a bath toy in sight! Habitat had a very similar, smaller bathroom bin in pretty much the same colour. As I’d never had co-ordinating bins before, that was a must-buy as well. Never thought I’d say that about a bin, but there you go. Candles in apothecary style glass bottles. 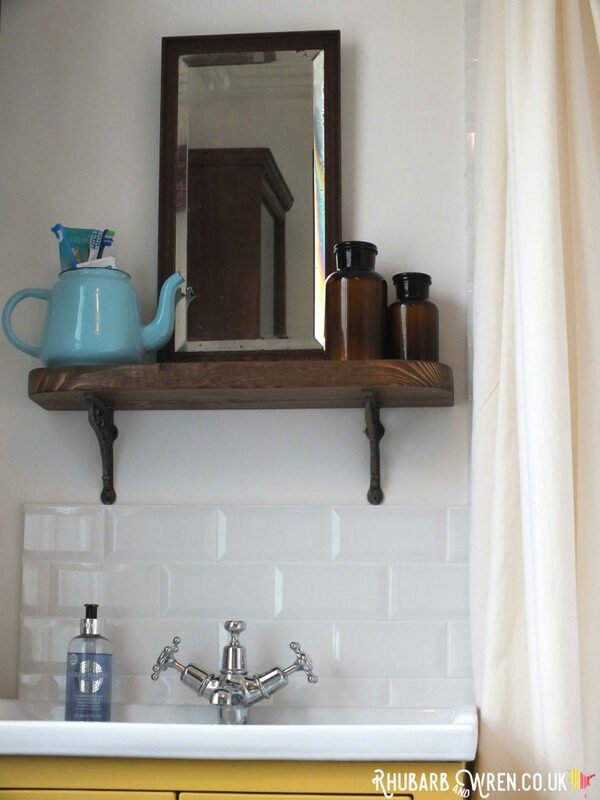 I couldn’t resist adding in a couple of quirky accessories for the shelf above the washbasin – an old enamel teapot for our toothbrushes that was just the same shade of turquoise as the floor (inspired by this image on Pinterest), and these great scented candles in apothecary-style glass bottles. The boat is a bath toy that got away. A small but perfectly designed bathroom with vintage and reproduction Victorian features. 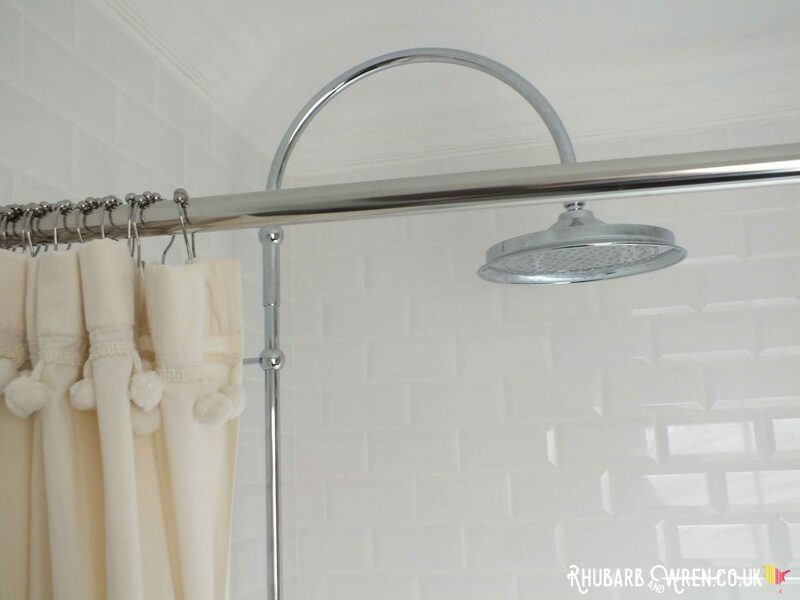 When we began planning the bathroom, we intended to install a towel heater that incorporated a traditional style radiator section (like this one). But once we’d decided on swapping the bath around, we realised that in the new radiator position under the window, none of those would fit. Other towel heaters just didn’t fit the bathroom style, so in the end we went for a traditional cast-iron column radiator instead. And in the course of ordering it (via Castrads wonderful website) we got seduced into splurging on a full-on statement piece ornate radiator (made by hand, weighs a tonne). It cost a little more than our original choice, but I LOVE it (and hey, we saved money on the floor and tiles, so really it wasn’t overspending at all…). 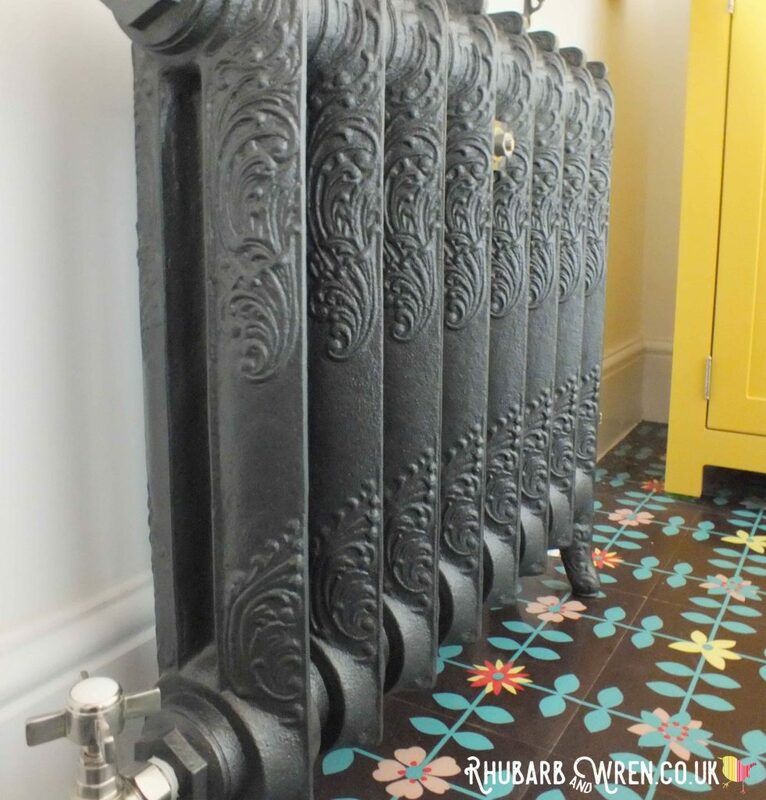 We love our cast iron ‘Rococo’ radiator – not OTT at all! While the kids are in the bath, I lean back against it and get a little back rubbing in… the ridges work splendidly as a massager! I think it’s the radiator that gives the room a definite steampunk vibe too – just a smidgin of whimsy and decadence. It’s sooo nice to look at too. It was a pretty easy decision to make. However the new window didn’t come with a sill, and it looked unfinished without one once the bath was moved. To create a sill, I just ordered a chunky radiator shelf from ebay, custom cut and stained to be extra long – it went directly under the window and makes a perfect windowsill. i.e. it’s wide enough for both books and wine glasses! Every bathroom needs a place to put your wine glass. I also ordered a shorter version of this shelf to go above above the basin – we only had chipped old cupboard before, and I really missed having somewhere to put our toothbrushes. Both these shelves came with traditional cast-iron brackets, and I managed to get a close match to those with another set of brackets I got for additional support under the wall cupboard we’d put up over the toilet. The basin vanity unit is painted in Farrow and Ball’s ‘Babouche’. Before we’d even moved in (seven years ago!) I wanted to get a roll-top shower bath for this bathroom – these are roll-top baths that have two flat edges fixed and sealed to the wall. This means shower (and bath) water can’t leak down the side; a problem we had with the roll-top in our previous place that meant the underneath of the bath could get pretty ropey (especially without a mop in the room!). This type of bath is so much more practical for us, but still looks and feels like a traditional freestanding bath. There are a few different companies doing these now. We went for Burlington’s version – the Hampton Shower bath and it’s perfect… deep, spacious and oh so comfy! With the exception of the vanity and basin, all the sanitaryware and taps were Burlington ones to match the bath. There were cheaper brand versions of this style around, but I found, with much shopping around, an online site with everything we wanted on sale – and as that site was cheaper than anywhere else anyway, this made for a really good price. I do love a bargain. 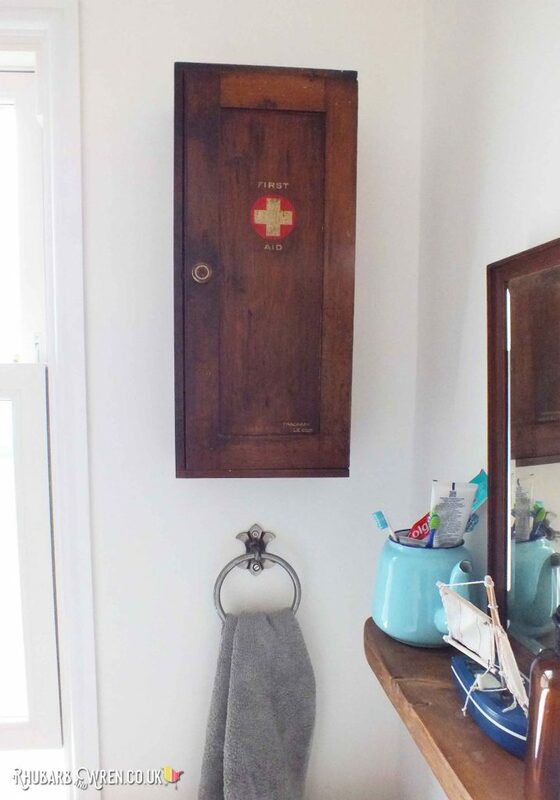 This vintage first aid cabinet was rescued from an old Print Works. The hand towel ring was purchased from a blacksmith selling on ebay, and is very solid and chunky. But probably my favourite purchase for our new bathroom was this vintage First Aid cabinet from an old print works in Leeds. It was rescued from the soon-to-be demolished building during the 60s by the father of the man I bought it from, and it still contained much of its original first aid supplies. Our vintage First Aid cabinet. Vintage supplies displayed in a key cabinet. As I wanted the cabinet to be useable, I had to clear out the vintage supplies but I thought it would be nice to display some of those original contents in the room. I found an old key cabinet that had beautifully aged wood of a similar tone to the original cabinet. To turn it into a shadow box, I just removed the rather grim watercolour of a duck that was framed behind the glazing in the door, so that the first aid bits could be seen through the glass. I popped in some of the best preserved bits, and hey presto – a lovely vintage display box and possibly the easiest upcycle ever! 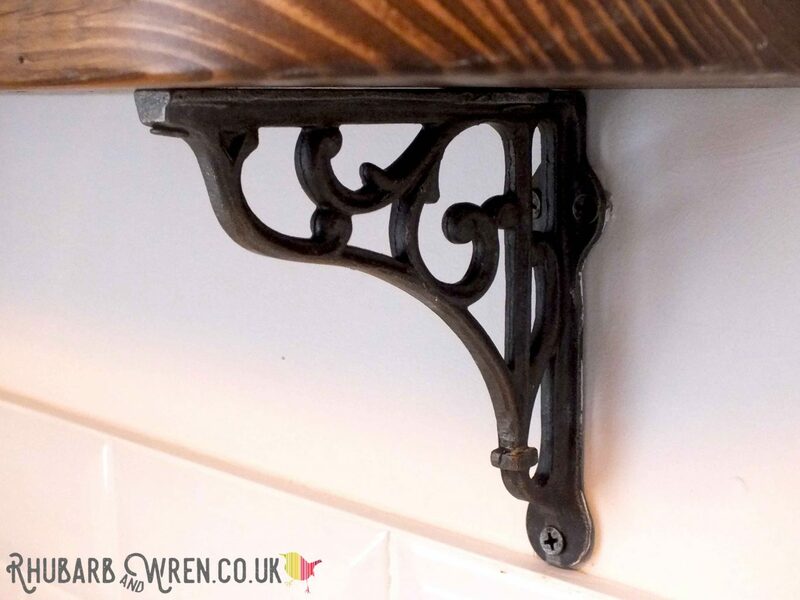 Cast-iron brackets help support the cabinet weight. 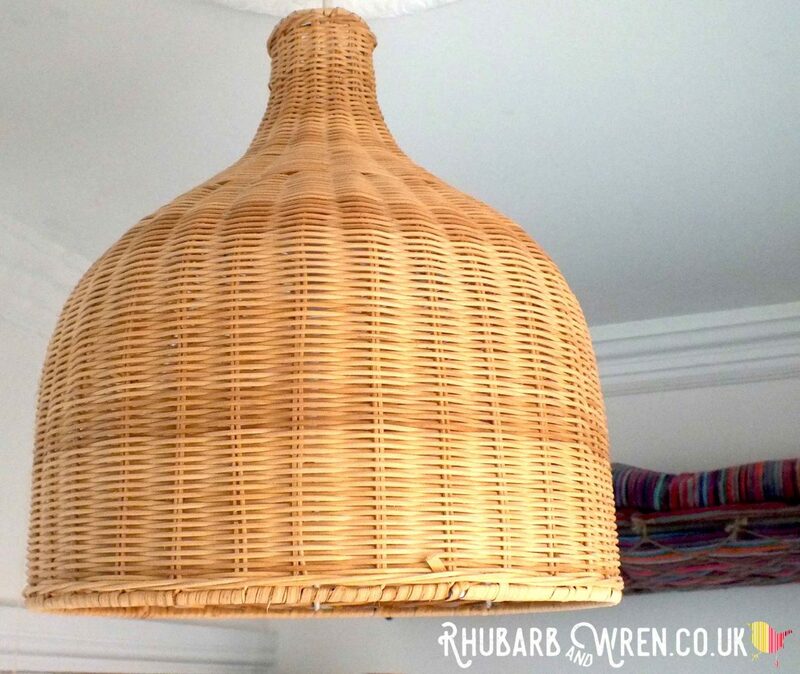 My other favourite purchase (okay, so there might be one or two other favourites too – let’s not forget that radiator!) was an antique cupboard for extra storage that we put above the toilet. It took me ages to find one that was not too deep to fit there, and the one I found had a dirty white interior in desperate need of a repaint.​I’d been torn between Farrow and Ball’s lovely teal ‘Vardo‘ and the sunny-yellow ‘Babouche‘ for the basin unit, so once we settled on the yellow for that, it made perfect sense to use Vardo for the inside of this cupboard. My two new favourite colours. I love the colour so much, I want to paint the whole house in it. The basin unit was another ebay find – a bespoke kitchen/bathroom unit company selling made-to-order units at less than half the price of the similar ones from Burlington (even with my bargain hunting). 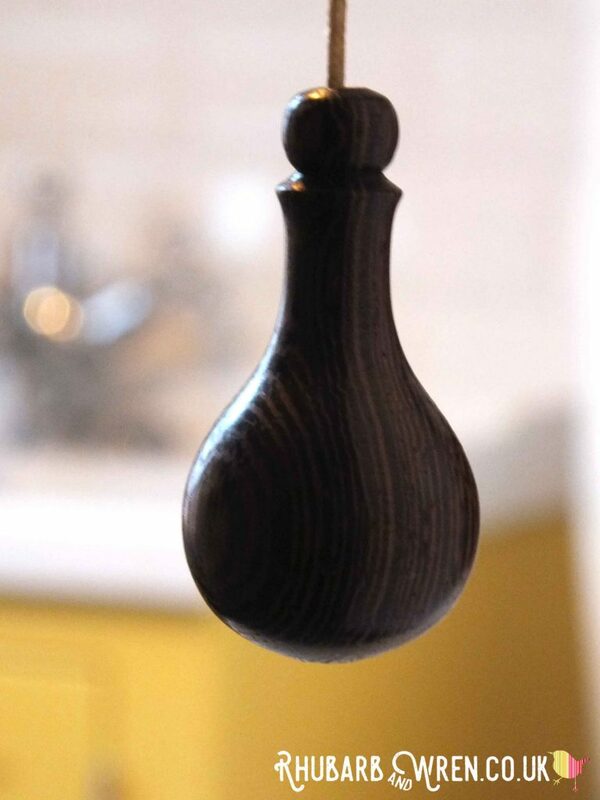 Even better, the price included having the unit spray painted in any Farrow and Ball colour you wanted. Babouche yellow it was, then! 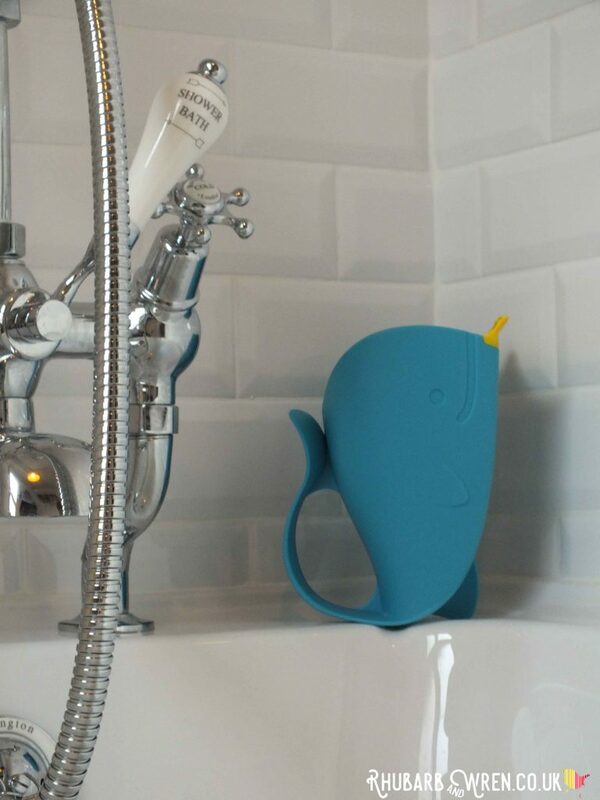 The kids have a ‘whale’ of a time in the new bath! The shower was, along with the radiator, probably the most extravagant purchase for the bathroom – although the combination I got (with the curved support) was being discontinued and therefore heavily discounted (yes, it’s all about the bargains). The basin and shower/basin taps are the Birkenhead range from Burlington – they have six points and look a little like Sheriff badges. The only thing to survive from our old bathroom! So there you have it – our new bathroom, so new it currently is still clean and tidy and smelling faintly of paint. I’m finding myself wandering in every time I pass by (and I seem to be passing by rather more often than usual) to admire little details that make me smile – pompoms on the shower curtain; shiny black bath feet on a flowery floor; the warm, tactile feel of our Etsy-find light pull; even the soft patterns of light from our wicker lampshade – the only thing to survive from our old bathroom. If you like the look of this, you may want to take a gander at my Pinterest inspiration board where I pinned lots of ideas while putting the room together. All the sources we used are also listed below, so do check them out! Vintage items: sourced mostly via ebay. Mostly. Grown-up Stuff, Home, Vintage. Bookmark. You did a fantastic job with the remodel. 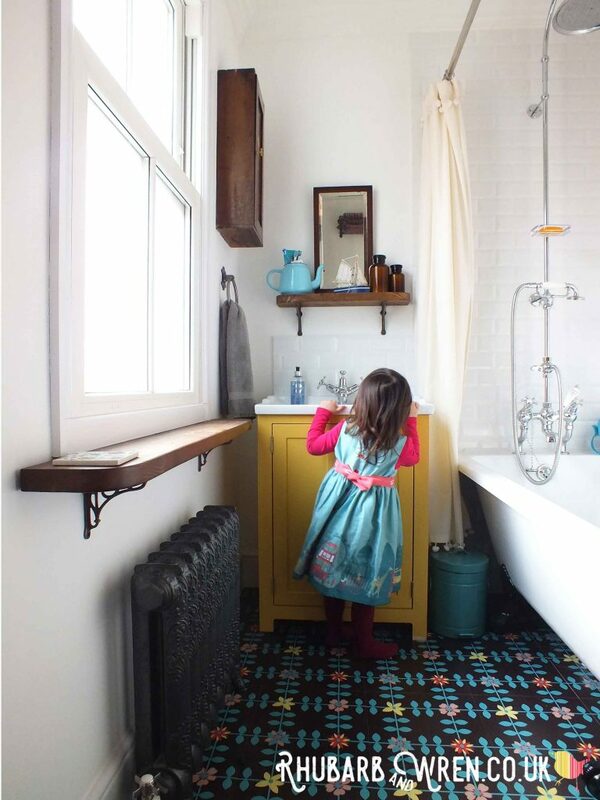 Moving the tub, the radiator, the 1st aid cabinet and the flooring choices are perfect! Thanks Jo! I love it soooooo much – definitely worth the hassle. Love the freestanding bath. Quite the transition you did there as everything was rearranged. Good thing your kid likes it. And we can see that.